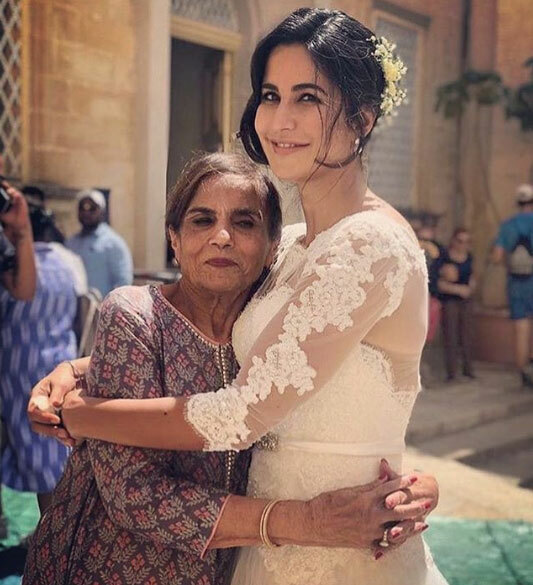 MUMBAI: Bollywood’s most eligible bachelor Salman Khan’s mother Salma Khan has expressed her wish to see Katrina Kaif as Salman’s wife, Indian media reported. Although, there have been many speculations about whom Tiger Zinda Hai actor should be marrying and when. Salman Khan's mother Salma Khan wish has come out in which she wants to see Katrina Kaif as her 'Bahu' (daughter-in-law). In an interview last year, Katrina Kaif had also disclosed that superstar Salman's mother had a desire that she should get married to Salman Khan. During these days, one picture of Katrina Kaif with Salma Khan had also gone viral on social media. Meanwhile, a few days back, Bollywood tiger Salman Khan when asked about his marriage date comedian Kapil Sharma, Khan shared that even in Bharat, he does not get married until he is 72 and that he is following the same ideology in his real life too. “Bharat film mein bhi shaadi nahi hoti till the time I am 72. Usi ko follow kar raha hun main abhi,” the actor said with a smile on his face. Bollywood admirers and followers couldn't be more glade to see their favourite actors tie the knot. However, the one actor and the most eligible bachelor of the Indian film industry none other than Salman Khan's wedding is what people are dying to see.